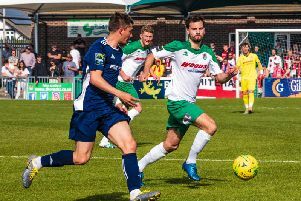 Burgess Hill Town will host Worthing in the FA Trophy. The Hillians will face Adam Hinsehlwood's side in the 1st qualifying round of the competition on Saturday October 27. There will now be 72 ties at this next stage featuring 144 non-League clubs. There are 88 clubs who enter the competition at this stage after being exempt from the first two rounds.